Since 2001, Langham Developments has played the most significant role in rejuvenating Edmonton's Downtown core and enhancing the skyline with exceptional projects. Each development is imbued with the same unwavering mandate: to deliver strong unrivaled architecture, uncompromising in quality. From initial design to final construction, Langham’s strict attention to detail ensures the delivery of beautiful, functional and desirable structures, each perfectly suited to the neighbourhoods in which they stand. Listed among Edmonton’s most experienced and reputable high-rise builders, Langham Developments is driven to achieve maximum quality in construction and design with each project it undertakes while enriching their communities. To date, Langham has completed 5 prominent downtown high rises: The Omega, Icon Tower I, Icon Tower II, Fox One and Fox Two. Two towers at 28 and 33 storeys completed in 2015 and 2017 comprised of 320 residential units on top of a 5-storey commercial podium. The towers house a variety of main floor retail shops, restaurants, and professional businesses, complementing neighbourhood visitors and residents. The towers were pivotal to the continued development of 104th street and Edmonton's downtown, 1/2 a block north from Icon Towers. The project is comprised of two towers at 30 and 35 storeys. They include 273 residential units, a 4-storey commercial podium and 5-storey podium with retail and office spaces. The buildings are located on 104 Street north of Jasper Avenue, one-half block south of Fox Towers. 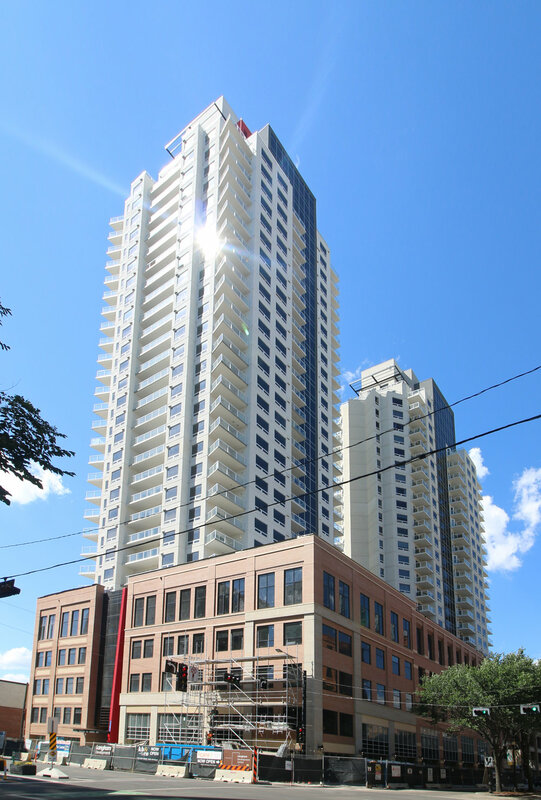 Icon Towers were completed in 2010, starting the revitalization of 104th street and downtown Edmonton. A mixed-use, 14-storey tower comprised of residential units with main level retail and office space. Located on the corner of 105 Street and 99 Avenue in downtown Edmonton. Completed in 2005. The Omega was one of the first projects to incorporate modern architecture in downtown Edmonton.